This modern take on the classic Western could use a little more soul, but it serves up almost everything else in heaping helpings. 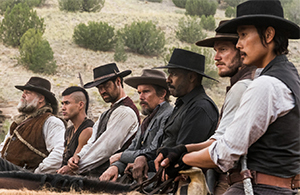 Talk about a storied history, Magnificent Seven has one. This spin starring Denzel Washington and Chris Pratt is a remake of the 1960 classic starring Yul Brynner and Steve McQueen. That, in turn, was an Anglicized take on Akira Kurosawa’s seminal Seven Samurai (1954), which itself was based on actual historical events dating back to 16th century Japan. It’s a simple story of good versus evil and, to a certain extent, poor versus rich. Both are timeless notions, with the latter being perhaps a bit more timely, given today’s social climate and barriers. Poor villagers — simple farmers and church-going peaceniks — are subjected to the tyrannical vision of one bad landlord, Bartholomew Bogue (Peter Sarsgaard, Flightplan). He lords over his land with a cold callousness and the opening scenes quickly set the stage for an old-fashioned story of justice and comeuppance. Of course, that’s old-fashioned, but with modern sensibilities. Take that to mean there’s a whole lot more violence (at times pushing the borders of PG-13) and a whole heckuva lot more people die this time around. The opening act serves as a terrific setup, playing off all the riffs, gimmicks, devices, plot points and what have you of those olden Westerns. There are duels, gunfights, damsels in distress, panoramic landscapes and nifty character silhouettes. It works. It’s entertaining. And it sets audiences up with expectations for a doozie of a showdown. Nonetheless, after watching the new Magnificent Seven, it felt like there was something missing. Something to move the narrative forward and set the stage for life after the good guys leave the peaceniks with their peaceful lives. These good guys — some with bad lives — swoop in and rescue a village from bad Bart (this time he’s a white capitalist; in the 1960 version he was a Mexican played by the Caucasian Eli Wallach). Aside from one strong-willed woman, Emma (Haley Bennett, The Equalizer), the men of the town seem as helpless in the wake of the devastating gunfights and explosions and bloodshed as they were before the action started. What’s missing? Maybe it’s Charles Bronson’s chat with children about the difference between cowards and those who conduct their lives with a sense of responsibility. It’s the narrative throw rug that tied the 1960 edition together and gave it a bit of thematic depth. Here, that slant is replaced with injustice piled upon injustice and the need for pure, unbridled retribution in the wild, wild West. This 2016 edition can be described as similar but different, much like the 1969 and 2003 versions of The Italian Job. In those movies, both use the Mini Cooper as a hook. Here, seven loners band together in the name of justice. Bits of dialogue overlap, themes are repeated, but both versions can co-exist as companion pieces. As with most remakes, there are things to be impressed with and there are other things lending disappointment. This time, the best enhancements stem from the characters’ back stories. In particular, Chisolm (Washington) and Goodnight Robicheaux (Ethan Hawke, Washington’s co-star in director Antoine Fuqua’s Training Day) have lived lives requiring true grit. And Sarsgaard is really good at being bad; he makes for a villain worth booing. As the sun sets on their adventure, the (surviving) magnificent ones ride off to Elmer Bernstein’s crowd-pleasing theme music. Perhaps that’s the movie’s only demonstration of restraint. One of the most familiar musical themes in movie history is saved for the very end, much like holding back on the Monty Norman until the very end of the 2006 edition of Casino Royale.